I visited Singapore for the first time in three and a half years. Actually, I used to live in Singapore for one and a half year to attend a business school. A reunion was held in Singapore, so that’s why I came back there. This times, I spent about a week going around Singapore to take as many photos as possible. In this article, I will write about Gardens by the Bay as part of Day 3. Following the previous post, I moved from Orchard to Gardens by the Bay. Gardens by the Bay is a large and future-oriented garden, which was opened in June 2012.Gardens by the Bay has several large and small gardens and pons with 110ha of land. I have been to Gardens by the Bay once before, but I didn’t have much interest in photography, so I decided to revisit it this time. From the Bayfront MRT station, there was the underground linkway. Then, I found a back shot of Marina Bay Sands. Over the lake, there were Supertrees, which were the icon of Gardens by the Bay. In addition, as the name suggests, there was an object of dragonfly in the right side of the photo. This was Dragonfly Bridge. I moved from Marina Bay Sands are to Gardens by the Bay area via the bridge. To begin with, I came to Supertree Grove. Supertree Grove is the area with Supertrees that imagine huge trees and becomes the symbol of Gardens by the Bay. 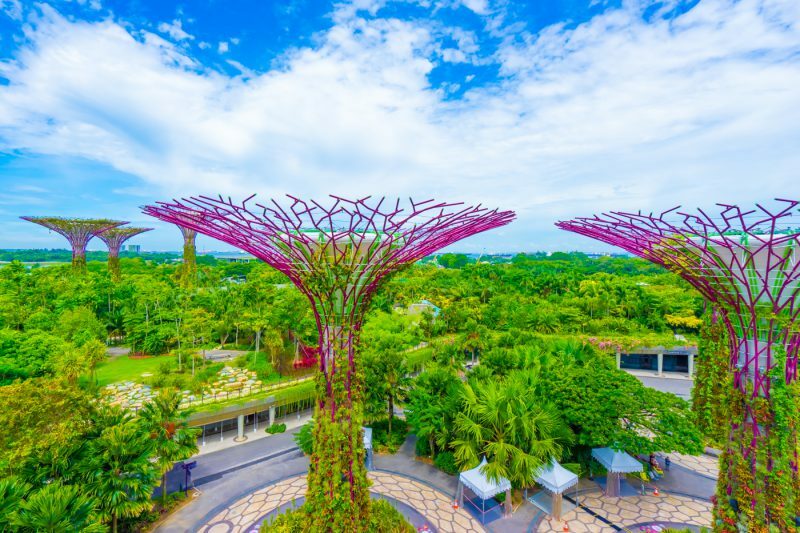 Supertrees have the hight of 25-50 meters. I went up the OCBC Skyway. The OCBC Skyway is an aerial walkway at the height of 22 meters. It is 128 meters long and visitors need to pay for admissions (S$8). Visitors are able to see Supertrees from at point-blank range. I am going to watch night illuminations at Supertree Grove later, but I left it and moved to Flower Dome and Cloud Forest, which were pay areas. First, I visited Flower Dome. Flower Dome is the largest glass greenhouse in the world and as listed in the 2015 Guinness World Records. Flower Dome has nine different themed gardens and exhibits plants from all over the world. Then, I visited Cloud Forest. As the name suggests, it is a cool dome that recreates cloud forest. The prime exhibit is a artificial mountain with the height of 35 meters and there is also a waterfall. You can see Marina Bay Sand over the glass. I climbed up to the top of the mountain by an elevator and went down while seeing surrounding views. The standard rate for two conservatories (Flower Dome and Cloud Forest) is S$28 and I think it’s worth visit. After I left Could Forest, I walked around Gardens by the Bay. Back side of Flower Dome. This was Golden Garden, another area with Supertree. I had an early dinner at Satay by the Bay. Then, I watched the illuminated garden and I will write about it in the next article. In the next article, I will write about the night illumination of Gardens by the Bay. Gardens by the Bay: night illumination and show!